* depends on the number of applicants. The Prospectus and Application Form can be obtained from the College office in person during working hours. The candidates should submit their application duly filled in, within the time fixed by the college. The form should be submitted in person to the office along with the Xerox copies of all required certificates. 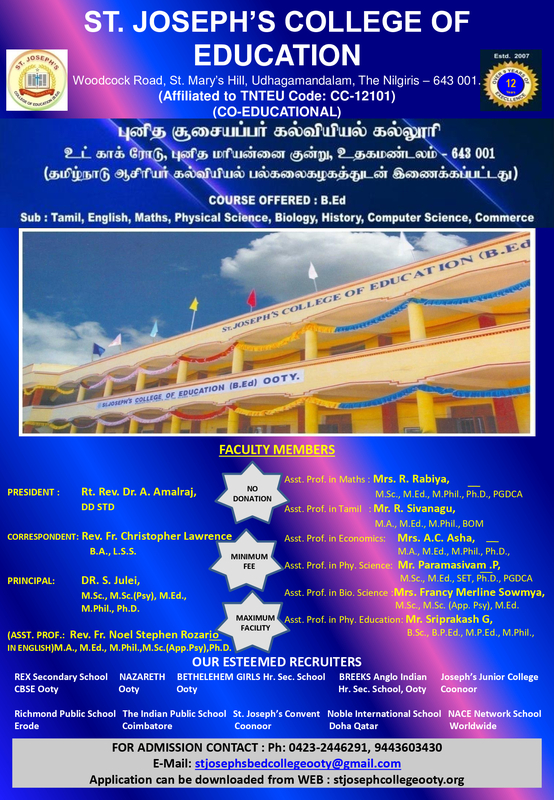 AND FINAL ELIGIBILITY IS DECIDED BY THE TAMILNADU TEACHERS EDUCATION UNIVERSITY. Two attested xerox copies of the following certificates must be sent along with the filled in application form. S.S.L.C. & +2 Mark Sheets. Provisional Certificate of the degree taken. Mark sheets of the degree examination. Migration Certificate for the student from other universities. Four recent Passport and two stamp size Photographs taken not earlier than a month before the date of application.